Lock is often underestimated in wedding photography. During this wedding at Storys building, we were taking a picture of the bride and groom in front of a moving streetcar in downtown Toronto. Suddenly, out of nowhere, Spider-man showed up and posed for the camera. The bride and groom were ecstatic as you can see in this wedding photo. Spider-man even congratulated the bride and groom on their wedding day before he took off on a skateboard. This candid shot of the couple, accompanied by Spider-man occupies a full spread in my clients wedding album. As wedding photographers, we often focus on lighting posing perfect composition, etc. and we miss the moments. After all isn't it more important to capture the love between the bride and groom in imperfect lighting then to photograph a pose with no soul? In my career as a Toronto wedding photographer I have been often lucky. However, as someone said, the more I work the luckier I get. Keep looking for moments, prompt the bridal party to give you genuine emotions and capture them in fine art photos and your photography business will thrive. From a composition standpoint, this is a perfect photo. 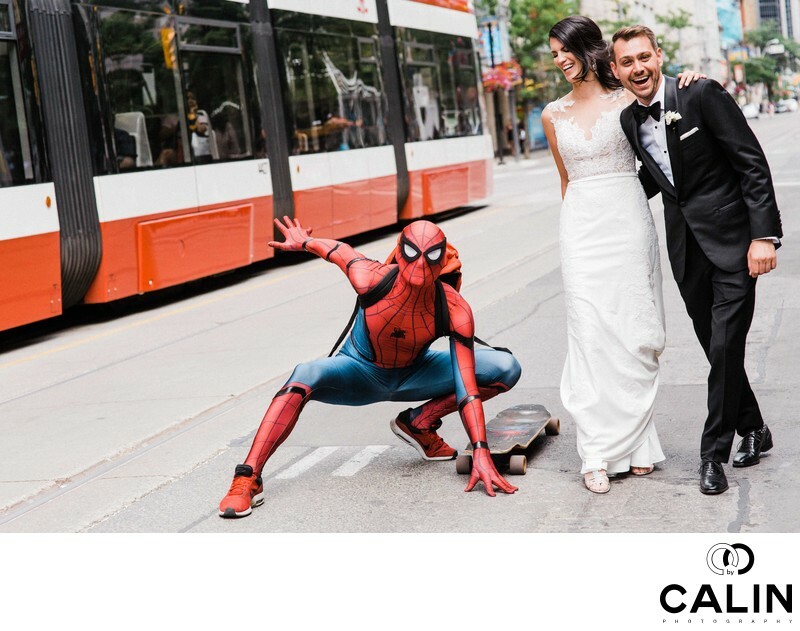 The subjects, the bride and groom accompanied by Spider-man are placed alongside the baroque diagonal created my the streetcar in the background. That gives this image an element of dynamism and tension, pleasing to the human eye. As a professional photographer, I am trained to recognize perfect elements of composition, good lighting and to pose my clients so that they look good. However there is an undeniable element of luck that helps in creating the perfect wedding photo. The Storys Building is a famous venue well known for the Toronto International Film Festival reunions and weddings. Location: 11 Duncan St, Toronto, ON M5H 3G6.